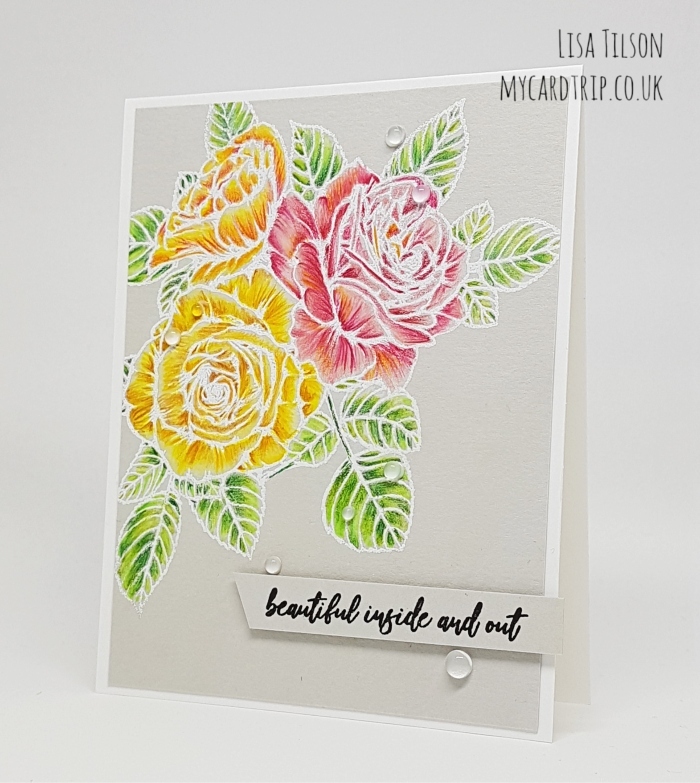 Today I have a card for you that has been coloured with my Faber Castell Polychromos pencils. 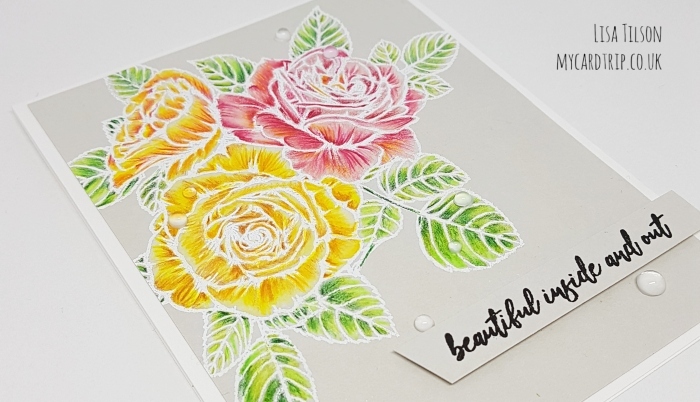 I was recently sent some stamps by Picket Fence Studios and this beautiful Rose Bouquet was amongst them. 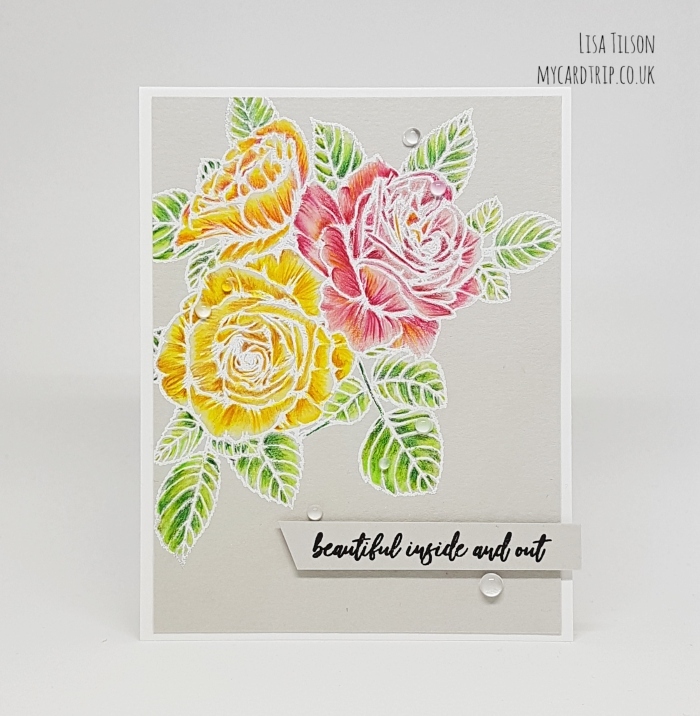 Picket Fence Studios are a fairly new company to me but I had been seeing lots of cards on Instagram featuring their designs over the past 6 months or so. 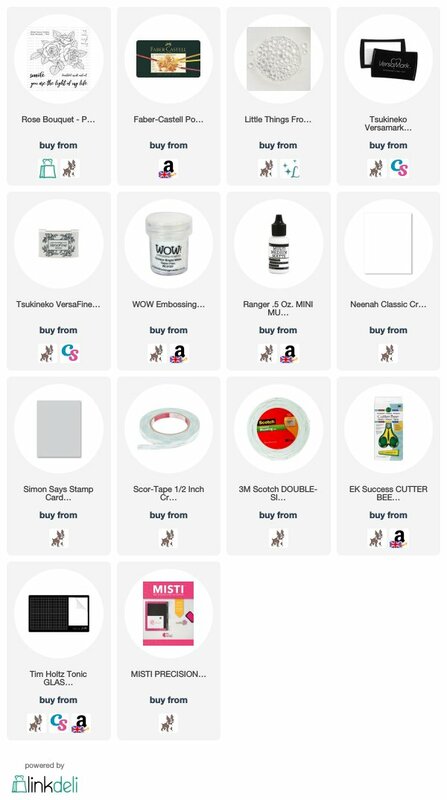 They are a small family owned business based in Louisiana and they have a really lovely range of stamps and stencils. Onto the card now! As I cannot resist a floral, it got inked up at the first opportunity, but this time, instead of my go-to watercolour, I thought I would see how I got on with pencils. Now I am by no means an expert with pencils, but I firmly believe you do not need to be an expert in anything to make a card. You should just enjoy the colouring process and treat it as a practice every time. So here is my card today. Instead of white, kraft or even navy cardstock, I thought I would go with SSS Fog cardstock today. From memory I don’t think I have pencil coloured on Fog cardstock before and I love the neutral tone – it really allows the colouring to pop. I prepped my cardstock with an anti-static bag before stamping the image with Versamark ink. I then applied WOW Super Fine White Embossing Powder as it is an intricate stamp and I used my MISTI for the stamping as I did need to double stamp. The panel was heat set and the colouring process began. For all of the colour names/numbers, please see below, but what I did as far as possible was to start my colouring by using a white pencil in all the areas that were large enough to take it. This gives a really good base from which to build your layers of colour. I didn’t really have any kind of routine with my colouring, but generally after applying the white pencil, I then went in with another light colour, then one slightly darker until I got to the darkest tone. I started with the leaves and then worked on each flower individually. For each flower I bought in a little bit of colour from one of the neighbouring flowers, hoping this would tie them together. I always find yellow the hardest to colour – with Copics, watercolour and pencils. It nearly always ends up too orange but today it was a little bit too garish and bright, so I took a brown pencil and added in some brown to tone it down a bit. I think that worked well. It almost ended up looking a little bit golden in real life. The colouring took a few hours – this is not a quick card to make! But it is relaxing to colour and play around. I then trimmed the panel and mounted it onto an A2 top folding card using DST. The sentiment was stamped with Versafine Onyx Black ink onto Fog cardstock, trimmed and mounted with foam tape. To finish off, I added some Raindrops from Lucy’s Cards. And that finishes today’s card. 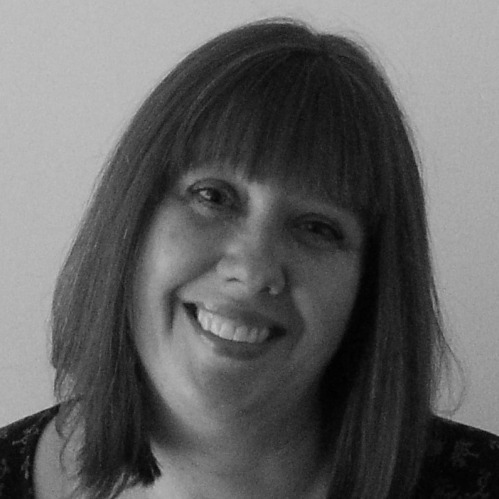 Thank you for popping by, I appreciate it and I love to hear from you if you have time. I will be back soon with another project for you but in the meantime, happy crafting! Gorgeous pencil crayons work, very nice look on fog cardstock. Love so many of Picket Fences stamps, need to save a bit of international shipping after new year. Thanks Lisa. Your card is lovely. The colors are great and blended nicely. I had never heard of the Picket Fence so I had to go have a look see. They have some nice stamps and sentiments.